Wash fresh cherries with cool tap water but do not soak; drain. Stem cherries and place in an 8- to 10-quart heavy Dutch oven or kettle. Barely cover cherries with water (about 3 1/2 cups). Bring to a simmer (do not boil as flavor will be less). Simmer, uncovered, about 20 minutes or until soft and the skin on the cherries starts to split, mashing cherries with a potato masher during cooking. Remove from heat. Place a fine mesh sieve over a large bowl. Ladle cherry mixture into the sieve. Using the back of a large spoon, press cherries through the sieve; discard seeds and cooked skins. Place the sieve or a colander lined with four layers of 100-percent-cotton cheesecloth over a large bowl. 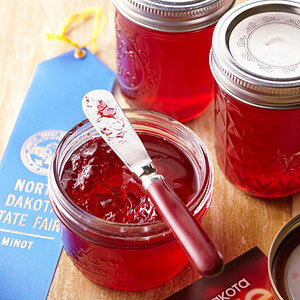 Strain cherry juice; do not squeeze cheesecloth if you want a clear jelly. Measure 3 1/2 cups liquid. Discard pulp. In a 4-quart heavy Dutch oven or kettle, stir together the 3 1/2 cups strained liquid and the pectin. Heat on high, stirring constantly, until mixture comes to a full rolling boil (bubbles break the surface so rapidly you cant stir them down). Add sugar; stir to combine. Return to boiling; boil for 1 minute, stirring constantly. Remove from heat; quickly skim off foam by gently scooping off the top with a metal spoon. Ladle into hot, sterilized* half-pint standard canning jars, leaving a 1/4-inch headspace. Wipe rims; adjust lids. Process jelly in a boiling-water bath canner for 5 minutes (start timing when water returns to boiling and keep the water boiling gently during processing). Remove jars; cool on wire racks. When jars are completely cool (12 to 24 hours), press the center of each lid to check the seal. If dip in lid holds, the jar is sealed. If lid bounces up and down, the jar isnt sealed. (The contents of unsealed jars can be refrigerated and used within two to three days or reprocessed within 24 hours. To prepare the canning jars, wash them in hot, soapy water; rinse thoroughly. To sterilize the jars, immerse them in boiling water for 10 minutes. Be sure to use screw bands and new flat metal lids with a built-in sealing compound. Prepare screw bands and lids according to manufacturers directions.